The second largest city in the Netherlands, Rotterdam lies on both banks of the Nieuwe Maas, the tidal southern arm of the Rhine, where it's joined by the little River Rotte. It's also the world's largest port, home to the massive Europoort facility through which so much freight passes on its way to and from the continent. Although almost completely destroyed by German air attacks in 1940, central Rotterdam was energetically rebuilt after the war and re-planned with modern shopping streets, residential districts, and high-rises, making it one of the most modern and architecturally interesting cities in Europe. Despite it's modernity, the city dates back to medieval times and was already prosperous by the 13th century, when a dam was built to separate the Rotte from the Nieuwe Maas (hence the city's name). Rotterdam has also long been important as a cultural hub, its early prosperity leading to the birth of Rotterdam's most celebrated citizen, the humanist Erasmus, born here in 1467. Today, it's as popular for its vibrant entertainment options as it is for its many fine museums, splendid architecture, and maritime tourist attractions. Museum Boijmans Van Beuningen, one of the Netherlands' (and Europe's) most important art centers, is known for its superb collections of paintings, sculptures, and applied and decorative arts from across Europe. Painters of the 14th to 16th centuries are particularly well represented, with works by Hubert and Jan van Eyck, Hieronymus Bosch, and Pieter Bruegel the Elder. The 17th century is represented by Rembrandt and Rubens (26 of the latter's works can be viewed), while later centuries are represented by Monet, Gauguin, and Van Gogh. Modern painters represented include Picasso, Matisse, and Chagall. Another museum of note is the Wereldmuseum Rotterdam, an ethnographic museum established in 1883, with excellent displays of artifacts from ancient and modern cultures from around the world. Great St. Lawrence Church - Grote of Sint-Laurenskerk - is all that's left of Rotterdam's medieval buildings, most of which were destroyed during WWII. In Grote Kerkplein, the late Gothic church dates from the 15th century and was built on once marshy ground giving the building a peculiar lean that was only halted after its foundation was rebuilt in 1650. It was heavily damaged in bombings, but was fully restored at the end of the war. Upon entering the church, you'll be struck by the beauty of the bright interior, an effect heightened by the colored glass of its windows. The church is famous for its three Danish organs, the largest of which stands on a marble base on the inside wall of the tower. The bronze doors of the main entrance, on the theme of War and Peace, are by the Italian artist Giacomo Manzu, and in front of the church is a statue of Rotterdam's most famous son, Erasmus. Guided tours are available, although the small admission fee includes a very informative audio guide. Rotterdam is home to many fine examples of modern architecture, much of it inspired by the city's waterside setting as well as a response to the devastation of WWII. Pushing the architectural envelope to the max are the city's famous Cube Houses (Kubuswoningen). Designed by Dutch architect Piet Blom, this block of houses, with their unique cube-shaped upper stories, are clearly visible from a walk through the Old Harbor, and one of them, the Show Cube, is open to visitors and contains displays on the design and history of the buildings. Another architectural gem is the White House (Witte Huis). Once Europe's tallest building, this stunning ten-story Art Nouveau structure was built in 1898 and is now a National Heritage Site with superb views from its rooftop. 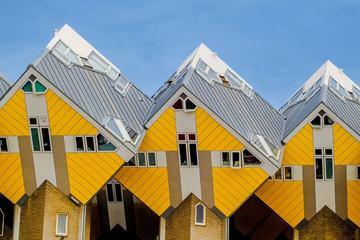 Finally, those with an interest in the design of buildings should visit the Netherlands Architecture Institute, home to a superb museum outlining the development of various architectural movements over the decades. One of the most popular gathering points in Rotterdam is the impressive Markt, which opened in 2014. Its soaring arched ceiling is covered in larger-than-life murals of vegetables, fish, and other food subjects, and the market itself is a kaleidoscope of fresh and prepared foods. You'll find fast foods of every sort and restaurants serving everything from traditional Dutch favorites, like Stroopwafels, to Balkan foods, Spanish tapas, and exotic Indonesian dishes. On the River Noord, just 23 kilometers east of Rotterdam, is the beautiful little village of Kinderdijk (the "children's dyke"). Taking its name from a famous legend that describes a baby's cradle being stranded here during the St. Elizabeth's Day flood of 1421, it's one of the most visited places in the Netherlands. Each of its 19 perfectly preserved 18th-century windmills is designated as a UNESCO World Heritage Site. Built between 1722 and 1761, together they comprise the largest surviving concentration of windmills in the country, a history that's celebrated during special Mill Days, when their sails are once again set in motion. The centerpiece of Coolsingel, the main street of Rotterdam's city center, is the Town Hall (Stadhuis), built between 1914 and 1920 in Dutch Renaissance style. It almost miraculously escaped destruction in World War II bombing. You can't visit the richly decorated interior on your own, but tours are available, booked through the tourist office. Opposite the Town Hall, in the busy Stadhuisplein, is a war memorial designed by Mari Andriessen. Other Coolsingel highlights include the World Trade Center, a high-rise building with a facade of greenish-blue glass, and the Bijenkorf ("Beehive") department store (by Marcel Breuer, 1958). Fronting Bijenkorf is the 26-meter-high work of sculpture, Construction (1957), by Naum Gabo, a French sculptor of Russian origin. Rotterdam's massive port occupies half the city's total area of 247 square kilometers, much of it in turn occupied by Europoort, a huge complex known as the Gateway to Europe. In addition to countless massive ships, you'll see mile after mile of quays and storage facilities built to service the world's busiest port. One of the most popular excursions begins at Maeslantkering near Hoek van Holland (Hook of Holland) and includes a close-up look at the city's massive surge barrier. Evening tours are also fun, especially with Rotterdam's most famous landmarks, including the superb Erasmus Bridge, being spectacularly illuminated. Established in 1857 and one of the oldest zoos in the Netherlands, Rotterdam's Royal Zoo (Diergaarde Blijdorp) is well known for its successful breeding programs. Highlights of this include a number of young elephants, as well as the rare red panda, fascinating creatures to watch as they explore the large enclosures designed to resemble their natural habitats. Natural habitats are a priority here: the Asian section includes a swamp forest with two large aviaries for exotic birds, a Mongolian steppe, a bat cave, a Chinese garden, and numerous creatures indigenous to the region. Also worth exploring is the Oceanium, an excellent aquarium featuring a large collection of marine life from the Americas. One of Rotterdam's most distinctive landmarks, the Euromast lies at the north entrance to the Maas Tunnel. Erected in 1960, this 185-meter-high tower houses two restaurants with superb views over Rotterdam, each at the 92-meter mark. For thrill seekers looking for more than just great views there's the chance to abseil down the building, while those looking for a unique overnight stay can book one of two stunning suites located at the 100-meter point. English language guided tours are available. The old district of Delfshaven, which unlike much of Rotterdam survived WWII largely unscathed, is consequently one of the most popular spots in this big bustling city. It is revered by the Dutch as the birthplace of Admiral Piet Hein, a 16th-century hero of the country's long war against Spain. For Americans, it's notable for the Old Church (Oude Kerk), where the last service was held in 1620 by the Pilgrims before sailing for the New World to found Plymouth, Massachusetts. This is commemorated with a memorial and bronze tablet. Also worth visiting is Dubbelde Palmboom Museum, housed in a 19th-century warehouse containing a large collection of material on the history of Rotterdam, including archaeological finds, implements, and equipment. Another example of Rotterdam's modern-yet-functional architecture is the Kunsthal, or Art Hall. This trendy gallery opened in 1992 and hosts a variety of constantly changing exhibits of visual arts, design, architecture, and culture from across the globe. Another gallery of note is the Chabot Museum featuring the works of Dutch painter and sculptor Henk Chabot, housed in a superb white villa built in 1938. Those with an interest in photography should visit the Netherlands Photo Museum (Nederlands Fotomuseum), where highlights include a broad collection of historical images by a number of Dutch photographers. Luxury Hotels: In a prime location, a five-minute walk from the city center, Mainport Hotel presides over impressive views of the city skyline from the banks of the river Maas and blends influences from East to West in its sultry, modern style. The spa features a Finnish sauna and hamam. Across the river from the city center, steps away from public transport, the Green-Key-certified, Suite Hotel Pincoffs occupies a historic 19th-century customs house and frequently rates as the city's best boutique hotel with its affordable yet swanky suites. If you prefer a large chain hotel, the pet-friendly Hilton Rotterdam, with a 24-hour fitness center and Michelin-star restaurant, is within walking distance of Central Station and the shopping district. Mid-Range Hotels: At the top-end of the mid-range hotels, citizenM Rotterdam, steps from Blaak station and a short stroll to the maritime museum and Coolsingel, bills itself as affordable luxury, with a wall-to-wall window in each room, a homey lobby that feels like a living room, and an innovative design concept. The nearby Ibis Rotterdam City Centre, on a small canal, is also great-value, with small, bright rooms, while the Holiday Inn Express Rotterdam - Central Station sits a short stroll away from Central Station and fabulous shopping. Budget Hotels: Near the Museumpark, Central Station, and great shops and restaurants, easyHotel Rotterdam City Centre offers small, clean rooms in the heart of the city. The Hotel Baan is near a train station and within walking distance to the Euromast, while Bienvenue, a two-minute walk from the city center, offers basic rooms for a budget-friendly price. Many pleasant excursions await within an easy commute of Rotterdam. One of the most popular is Bergen op Zoom, a historic old town some 67 kilometers south that is noted for its large squares and pleasant pedestrian zones. It's also where you'll find Markiezenhof Palace, a 15th-century mansion that now houses a cultural center and museum with numerous fine paintings and period furniture. Also worth a visit are Breda, 52 kilometers southeast of Rotterdam, with its museums and monuments, and the town of Gorinchem, 44 kilometers to the east. Another must-see is the Witches Weighhouse (Museum de Waag) in Oudewater, famous for once having been used to weigh those suspected of witchcraft; if you were considered light enough to ride a broomstick, the theory was that you were a witch (fortunately for the women of Oudewater, none of the accused were considered light enough to be punished). About 70 kilometers from Rotterdam, Zierikzee on the island of Schouwen-Duiveland lures tourists with its yacht harbor, a picturesque old town center, and beautiful beaches fringed by wooded dunes. Halfway between Rotterdam and Utrecht, Schoonhoven is a good day's excursion for its superbly preserved medieval buildings. St. Bartholomeuskerk, founded in the 13th century and notable for its tendency to lean off the vertical, has stalls carved with scenes from the life of Christ. Be sure to see the 17th-century pulpit with its figures of the 12 Apostles, and the tomb of Olivier van Noort, the first Dutchman to circumnavigate the globe, in the early 1600s. The Schoonhoven Town Hall (Stadhuis), built in 1452 in Late Gothic style but much altered in later centuries, has a domed hexagonal tower containing a carillon of 50 bells. Other town highlights include the picturesque Weigh House (Waag) from 1617 on top of a dam above the harbor; the Gold, Silver, and Clock Museum (Nederlands Goud-, Ziver- en Klokkenmuseum); and the Edelambachtshuis, a granary built in 1566 that now houses a collection of jewelry from the 1600s to the 1900s. One of the most popular excursions from Rotterdam is Bergen op Zoom, a historic old town 67 kilometers south that is noted for its large squares and pleasant pedestrian zones. It's also where you'll find Markiezenhof Palace, a 15th-century mansion that now houses a cultural center and museum with numerous fine paintings and period furniture. Also to the south, Zierikzee on the island of Schouwen-Duiveland lures tourists with its yacht harbor, a picturesque old town center, and beautiful beaches fringed by wooded dunes. 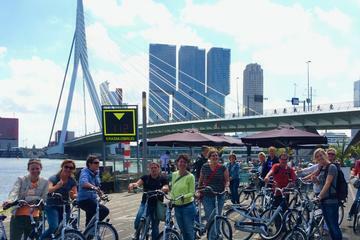 Half-Day Walking Tour and Harbor Cruise: You can see Rotterdam's top sights from the land and sea on the half-day Rotterdam Walking Tour Including Harbor Cruise. The Old Harbour, Cube Houses, and Museumpark are just some of the attractions on the itinerary of this private tour. After strolling around the city streets, you can relax on a harbor cruise and view the city from a different perspective. Architecture Tour: If you're interested in learning more about Rotterdam's landmark buildings, the Private Rotterdam Architecture Walking Tour is an excellent option. On this three-hour walking tour, you'll see impressive buildings like Rotterdam Central Station, the Cube Houses, and Rotterdam Market Hall (Markthal) and hear fascinating stories about their history. Almost any point in the Netherlands is within easy reach of Rotterdam. Just to the north is the porcelain center of Delft and beyond are The Hague as well as Leiden, one of the country's main cultural centers. Only 40 minutes by train, busy Amsterdam is another good base for day trips. 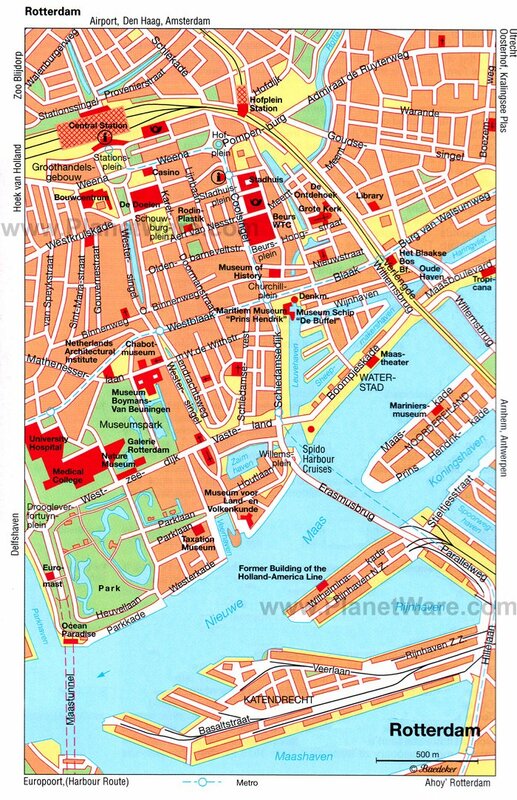 Just to the north, Haarlem lies between Amsterdam and the North Sea. A few kilometers east of Rotterdam is the country's fourth largest city, Utrecht, and beyond it, on the banks of the Rhine, is Arnhem. North of it stretches the Hoge Veluwe National Park, with its outstanding Kröller-Müller Museum housing 280 works by Vincent Van Gogh. South of Rotterdam is Eindhoven, filled with art museums, parks, and lovely historic buildings.